Wednesday, May 11, 2016 10:30 A.M.
Visitation Tuesday 3-7 P.M. Wednesday 9-10:30 A.M.
Joan M. Eckstein was born July 14, 1932, on the family farm near Honey Creek, Iowa to William and Irene(Spacek) Toman. She went to grade school in rural Honey Creek and graduated from Thomas Jefferson High School in 1950. She went to beauty school and worked as a beautician for several years. She also enjoyed traveling to Alaska. On September 26, 1958, she married Anton Eckstein in Fremont, Nebraska. They lived near Linwood where Joan was a housewife and homemaker. She enjoyed gardening, cooking and was very artistic. 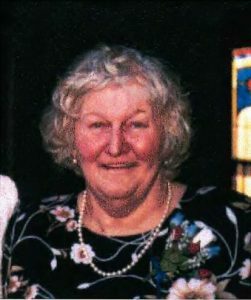 Joan is survived by two daughters;Tillie Eckstein of Genoa and Cindy(Mark) Madsen of North Bend, one son Frank Eckstein of Linwood, four sisters;Gloria Sorenson, Crescent, Iowa, Eva Oltmanns, Neola, Iowa, Mary Lou Redmond, Indian , Alaska and Jenny Knott of Crescent, Iowa, and three grandchildren;Samantha Hultquist, Ames, Nebraska, Mackenzie and Charles Madsen, both of North Bend. She was preceded in death by her parents, husband, son Anton Martin Eckstein, three brothers;Leo, Johnny and Willie Toman and an infant sister, Mary Ann.